Taira Honda began his university studies in 1951 when he entered Tokyo University. 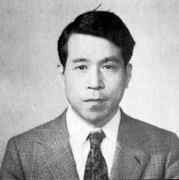 He joined T Tamagawa's seminar his 1954-55 which was his final undergraduate year. After graduating in 1955 he continued to study at Tokyo University, undertaking research supervised by Tamagawa. Mathematicians like E Artin, Chevalley and A Weil came to our country for this occasion, and significant contributions to long-standing problems of the theory of complex multiplication by Goro Shimura and Yutaka Taniyama as well as by A Weil were reported at the Symposium. These circumstances surely had a strong influence on the mathematical formation of Honda in addition to the personal direction given to him by Tamagawa. He restudied and generalised the mathematical theories of Kummer fields and of cyclotomic fields from the standpoint of abelian varieties over algebraic number fields. Honda's next three papers all considered the problem of class numbers of algebraic number fields. Then in 1966 he published an important paper which began his study of applications of the theory of commutative formal groups to the arithmetical theory of abelian varieties. The main ideas of his doctoral thesis, which continued work which appeared in his first paper, was published in 1968. Isogeny classes of abelian varieties over finite fields appeared in Journal of the Mathematical Society of Japan in 1968. In this important paper Honda gives a complete classification of Abelian varieties up to isogeny over a finite field. The paper built on work of J Tate which had been published two years earlier and used results of Shimura and Taniyama in its proof. An important consequence is that Honda was able to give a short proof of Manin's conjecture about formal groups. Further work on the class numbers of algebraic number fields saw Honda prove that there are infinitely many real quadratic fields whose class numbers are divisible by 3 and also to classify those n for which the class number of Q(3√n) is a multiple of 3. In 1970 he published On the theory of commutative formal group. Many more papers on formal groups followed, in particular relating them to the zeta function. ... a most active mathematician, beloved by his colleagues and students as well as by his family. Most unfortunately, he took his own life for some unknown reason in May 1975. Always frank and friendly, he was popular among both his colleagues and students.